Following the successful launch of its online shop to the UK market in May last year, ProtectaPuss is now looking to export its UK designed and manufactured cat containment systems to cat lovers all around Europe. 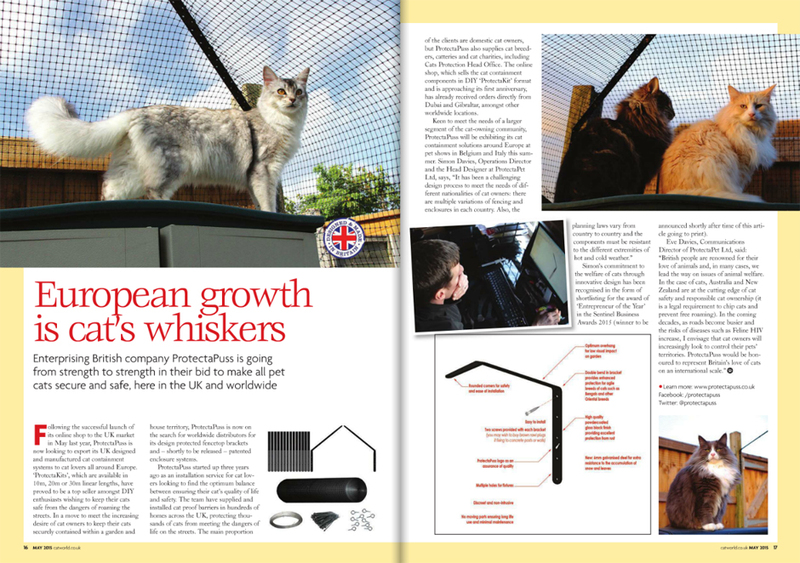 ‘ProtectaKits’, which are available in 10m, 20m, or 30m linear lengths, have proved to be a top seller amongst DIY enthusiasts wishing to keep their cats safe from the dangers of roaming the streets. In a move to meet the increasing desire of cat owners to keep their cats securely contained within a garden and house territory, ProtectaPuss is now on the search for worldwide distributors for its design protected fencetop brackets and – shortly to be released – patented enclosure systems. ProtectaPuss started up three years ago as an installation service for cat lovers looking to find the optimum balance between ensuring their cat’s quality of life and safety. The team have supplied and installed cat proof barriers in hundreds of homes across the UK, protecting thousands of cats from meeting the dangers of life on the streets. The main proportion of the clients are domestic cat owners, but ProtectaPuss also supplies cat breeders, catteries and cat charities, including Cats Protection Head Office. The online shop, which sells the cat containment components in DIY ‘ProtectaKit’ format and is approaching its first anniversary, has already received orders directly from Dubai and Gibraltar, amongst other worldwide locations. In addition to the innovatively designed fencetop brackets, Simon is currently prototyping steel enclosure systems and gates, to be launched later this spring. His commitment to the welfare of cats through innovative design has been recognised in the form of shortlisting for the award of ‘Entrepreneur of the Year’ in the Sentinel Business Awards 2015 (winner to be announced shortly after time of this article going to print).